I observe my husband: rolling out pasta dough to test out the newest recipes with the newest of gadgets (truly a passion of his); telling Siri to “skip to the next track” because he knows our favorites; wrestling with our dog before feeding him; and singing Kirtan Sohila to lull our baby boy to sleep. He does all of this, not just because I need recovery from giving birth, but out of commitment and love for his family. I am moved, as I recall him holding my hand and wiping my brow through my marathon of a labor while repeating the Sukhmani Sahib track for over 15 hours. He constantly encourages me to wear whatever I like, supports my kes, and furthers his understanding of feminism. He asks me to share my interpretation and translations of Bani and takes vocal and sitar lessons from me, while remaining hopeful that I may one day sing at Darbar Sahib. And no one is more excited for me when I beat him at a game of tennis (instead of letting me win) than him. I am beyond thankful for his continuous support. I list the above reflections because I strongly believe that it is because of our Guru Jis’ examples and Gurbani that my husband (whom I realize may be an exception) encourages me to be expressive, independent, and resilient. In cherishing him and seeing his love, I wonder how the Gurus must have loved; and am awestruck reflecting on their unfathomable capacity to do so, which I feel goes beyond our comprehension. I contemplate on this shabad revealed to Guru Raam Daas Ji on Ang 11, realizing that the Gurus sacrificed the “I” of the ego and affirmed that everyone is, “You” or Waheguru. You are the River of Life; all are within You. There is no one except You. I believe that it was this love and recognition of Waheguru within all that led the Gurus and their Sikhs to defend those who were seemingly “different” from themselves (i.e. various castes, people of diverse religions, genders, etc.). Our history is rich in inclusion and sacrifice in both the literal and figurative forms. For instance, the youngest to the eldest members of the Panth are martyrs, and the fact that Guru Ji compiled writings of enlightened people from diverse demographics in varying languages and musical styles within Guru Granth Sahib Ji. What greater love is there than that? The Gurus recognized a collective consciousness that runs through all of us – the One Soul. By calling us all feminine souls of One Husband (Waheguru) and documenting their views within Guru Granth Sahib Ji at a time where gender roles were (and still are) rampant, they challenged norms forever. As one reference, Guru Ji speaks of the bride and her demerits, which break her from the Divine. Guru Ji also praises the virtues which bring her closer to the Divine (Kuchaji/Suchaji). Such Bani serves as analogies for the soul’s condition. Thus I don’t view such shabads as limiting women’s roles. Instead, I view them as guidelines of how to improve our understanding of the Self. And, if anything, I give credit to women for being able to relate to these analogies more personally, since a majority of the relationships are referenced from the viewpoint of a woman. I strongly believe that the Gurus were feminists – they opposed misogyny and asserted total equality between sexes and genders. So why call her bad? From her, royalty is born. O Nanak, only the True Divine is without a woman. That mouth which praises the Divine continually is blessed and beautiful. Upon further interpreting this shabad, I do not feel that Guru Ji wanted me to believe that I, as a woman, am important just because I have the potential of giving birth. I believe these references were/are needed to challenge societal norms and declare that, while others may be dependent on them, women are sovereign. There has been a lack of attention given to women in our Sikh history. We are only able to list a few prominent Sikh women throughout time and we unfortunately know very little about them. In learning Sikh history, do Sikh women feel included or left out of the significant aspects of the Panth? – Why is there no Bani by women in Guru Granth Sahib? Were women so subjugated at the time that they didn’t have the space, time, or luxury to write or practice spirituality? Or did the Gurus have the foresight to realize that men’s egos would prevent them from reading writings by women? Who were the contemporary enlightened, Gurmukh women of the time? – Is there any evidence of women keertaniyas in Guru Ji’s darbar – specifically, in Darbar Sahib Ji? – Why were none of the original Panj Pyaare women (knowing Mata Sahib Kaur Ji was essential)? Were they conditioned by society to let men step forward first? Were they pushed to the back of the crowd and unable to hear Guru Ji’s calls? Were they engaged in langar seva instead? Surely, they were invited, but were they told to stay home by their family? Or did they “choose” to stay home due to social conditioning? – Why are no women mentioned in our Panthic Ardas (ie: Mata Sahib Kaur Ji, Mata Khivi Ji, Mai Bhago Ji)? It’s not to say that women never accepted Amrit on the historic day in 1699 after the original Panj Pyaare or that there were no female keertaniyas after Guru Jis’ time. But, we are only taught that men were the original Panj Pyaare, and Sata and Balvand Ji were original keertaniyas, and this incomplete history become reasons for many Sikhs (men and women) to assume that women have no place in leadership roles. The exclusion of women and perpetuation of male-centric traditions is most obviously seen at Darbaar Sahib Ji. Here, “tradition” dictates that practices must continue a certain way and without question. Here, tradition outshines Gurmat. Additionally, because examples of Sikh women in history are so difficult to find, their absences become excuses for authority figures to continue deterring women from performing certain types of seva. A culture of exclusion becomes the norm and the sangat is habituated into thinking it’s normal. Without research into historical precedence, historical accounts, gurmat, and rehat, we cannot effectively challenge sexist practices within places like Darbaar Sahib. Because of the innate access to open-mindedness from Guru Ji, I oftentimes vent to my empathizing husband about the current state of women in our Panth and how marginalized our contributions seem to be, or how we are sidelined. The irony is that Guru Ji worked so tirelessly to rid us of sexist practices, when all odds were against them, yet it seems as if the Panth has gone backwards. I have heard people say that, since Sikhi is the youngest religion in Asia, customs that pull us further away from the Divine ( i.e. rituals/lack of equality) don’t apply to us. Yet, in my opinion, given that Sikhi is the newest, it is surprising that such patriarchal practices have found their place in Gurdwaras and our psyche so quickly. It is through this reflecting that my husband further understands the disservice of just listing a few examples of Sikh women and their roles, or comparing Sikhi’s equality to that lacking in other faiths. Such practices can sometimes cause Sikhs to limit our own introspection and thus become unaware of patriarchal practices within our community and gurudwaras. (The list of inequality, sexism and prejudice within so called “Sikh” institutions is endless.) I am thankful that my husband encourages me to expect more of our Panth instead of settling; and I pray for a future where we can become closer to what the Guru Jis envisioned for us to be. The Gurus laid out a beautiful vision of a society where everyone is equal and it is our duty as Sikhs to live up to this. As we address our Ardaasaan to “Sache Mata Vaheguru Ji”, my husband and I are forever indebted to Guru Ji for teaching us to question norms while appreciating the inevitability of Hukam. – Ask women what changes they hope for within the Panth. And then listen. Then, find ways to act upon it. 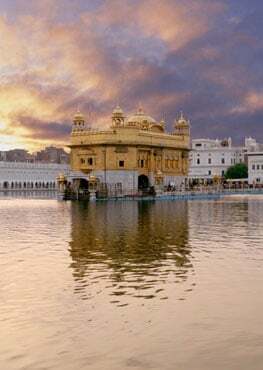 – Recognize the gaps between Guru’s message and realities of the Panth; talk about it. – Apologize for certain gurdwarey’s decision of disallowing women to sing or performing specific seva i.e.holding the Paalki Sahib, instead of assuming that women are okay with it. – Speak to women and men equally when addressing your “Fateh,” instead of gender segregating. – Reflect on practices within our community that become gendered and question them. – Research women in Sikh history. Be cognizant of the fact that, although women were essential parts of Sikh history, they haven’t been represented equally. Perhaps, find and tell more women-centric saakhis. – Ask the elder women in your community what has changed since their time. You may be surprised. And it may lessen the generation gap. – Realize that, if your parents were immigrants, they may not have had the leisure to think of these same matters (let alone to question them). Be respectful and understanding when you ask them for insight and experiences. – Encourage women’s career choices especially if they don’t fit designated gender stereotypes – it takes bravery to be a trailblazer. If they do have a career that is “traditionally female”, respect that too; all choices are valid. – Recognize that while society’s gender roles may shift across time, Guru Ji’s message won’t. – Be cognizant of microaggressions within the community (ie – asking women to wear Punjabi clothing to gurdwara while men don’t). – Assume women are okay with a certain amount of participation within gurdwara. After centuries of having limited roles in society, people get used to it – instead, challenge it. – Mansplain (or Womansplain) the reasons for why women aren’t welcome to perform certain types of seva – rather, question why not. – Assume that each generation should, and will, function the same as the past – the Guru Jis were dynamic individuals who changed the course of time. As their followers, we cannot afford to be stagnant. – Think that filling a couple roles with women in a divan is enough. – Speak over or interrupt women (actually, any gender of any age) when they’re talking to you. – Compare Sikhi to other faiths just to make yourselves feel better about Guru Ji’s principles. Recognize that we have strayed from the core as a community. – Assume that the reason a woman doesn’t volunteer for leadership roles or speak up in group settings is because she doesn’t want to; think about how she may have been conditioned to step back and what barriers to participation may be present (and then work to create a more inclusive culture). – Remember, sisterhood is powerful – Khalsa panth is for all! – Celebrate the achievements of other women; another woman’s success does not diminish your own worth. – Realize that roles of women across jathhebandis may differ but each one always has place for more female involvement. – Reflect and question with each other. – Take on roles in your local community that you wouldn’t have considered otherwise (i.e. doing chaur seva). – Recognize that those who are supportive of your goals, men and women alike, are pushing back against societal norms. This can be exhausting! Take care of them and take care of yourself. – Celebrate your victories, no matter how small they may seem! -Female/male and woman/man have been used interchangeably, though I am aware that the latter is socially constructed. Furthermore, this terminology was not meant to make those who have non-binary gender identities feel excluded. – This article is my humble opinion. I am in no way imposing anyone change their views. I am simply encouraging readers to question “Why?”, to gain a deeper understanding of Sikhi. Soni is currently navigating the ocean of motherhood whilst enjoying the beautiful California sun with her family. She loves to mix-and-match her socks, blend unique flavors in her cooking, and create bouquets of raags while singing. Her current goal: straighten husband’s dhaari to see how long it is. It is infused with gurmat and tailored for young Kaurs (Sikh women). Kaur Life hopes to be a space where Kaurs can express their ideas, share stories, and learn more about their Sikh culture to empower themselves. Why Does My Sangat Harass Me ?